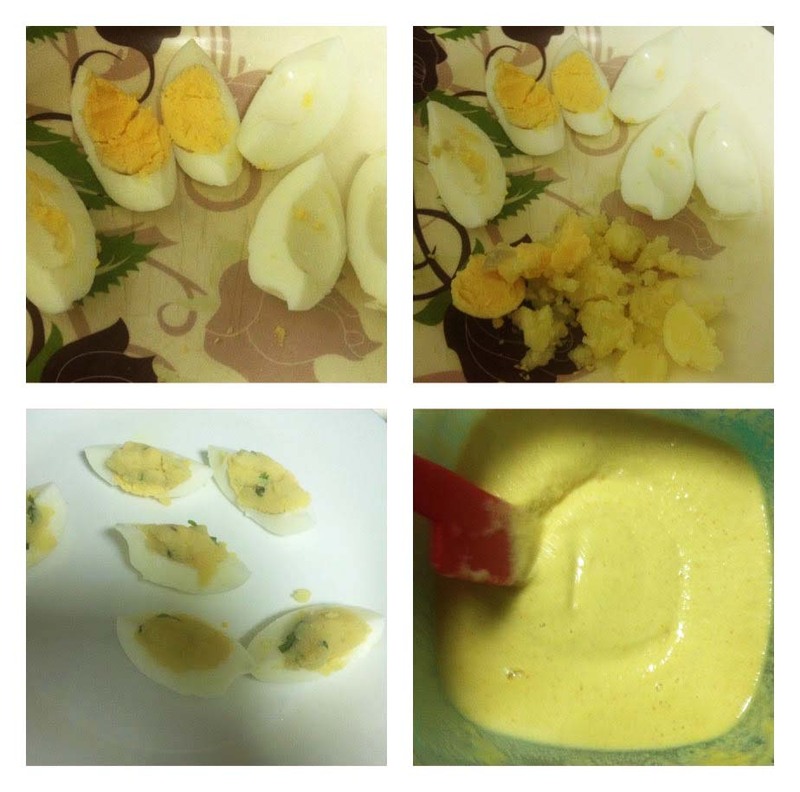 Hi foodies....Lets see how to prepare an easy quick snack with left over hard boiled eggs. It is one of my favorite egg snack after egg kabab. Egg bajji / egg pakora / egg bonda / mutta bajji is a lovely evening snack which is very common in street food stalls in India. Traditionally it is prepared with gram flour(besan) along with other spices. This crispy soft tea time snack goes well with a nice of tea. 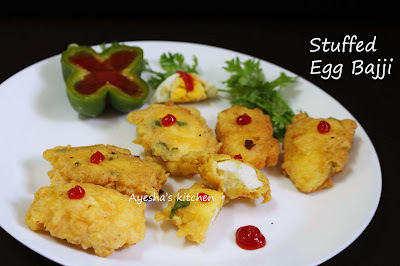 Here am sharing the recipe of stuffed egg bajji . Normally egg bajjis or egg pakoda is prepared by dipping the cut slices of egg in gram flour batter and then deep frying it. But here i just stuffed the egg with with mashed spiced potato along with egg yolk. You can also stuff it with onion egg yolk mixture or stuff it with coconut mint condiment (chammanthi). As it is time consuming , i move on to the easiest method. It is all up to our taste and preference. 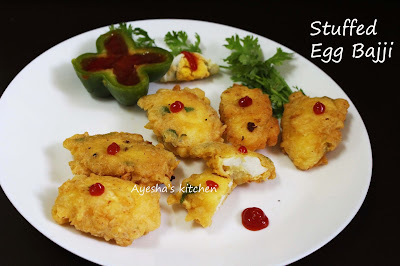 So lets see how to make stuffed egg bhaji with mashed potato egg yolk stuffing . Enjoy!!! Cut the hard-boiled eggs into halves (lengthwise only). Then remove the yolk and again cut each slice into two halves. In a bowl, mix the mashed potato with this egg yolk along with chili powder and salt. Now take a small portion of this mixture and stuff it in egg yolk position of each egg slice. Set aside. Now prepare the batter by mixing gram flour, rice powder, chili powder, baking powder, chopped coriander and salt. Make a medium thick batter like idli batter. You can add water for making the batter. Then heat oil in a wok. When hot, dip the stuffed egg in this batter fully with the stuffed portion upwards. Once hot, make the flame medium and immediately drop it into the hot oil. Deep fry until golden. Flip gently and fry both sides. Drain it to a paper towel. Serve hot with ketchup or tomato chutney.